I am such a huge fan of hemp seed! I am all about finding ways to increase protein intake the plant based way, and hemp is truly the perfect complete protein source. 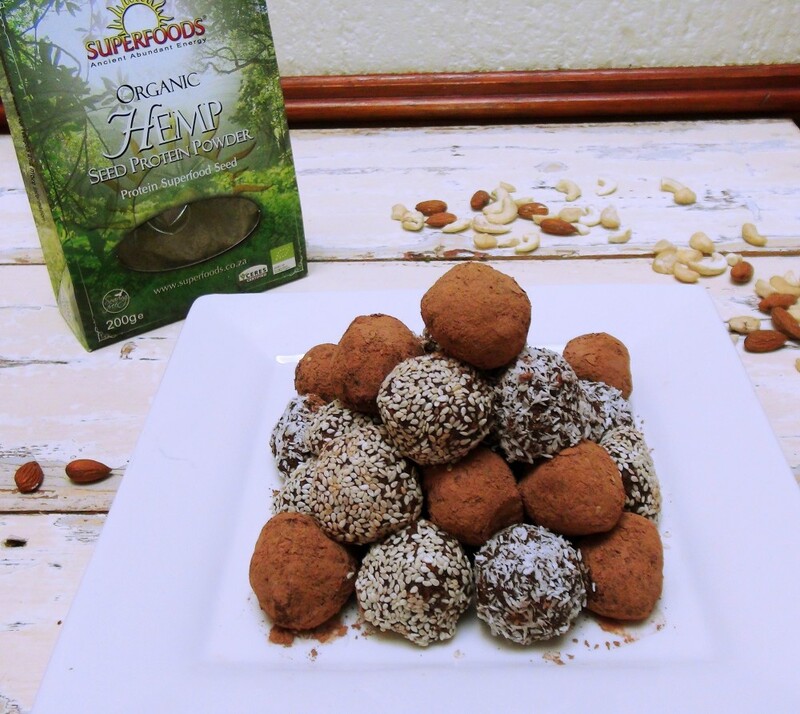 The protein and fibre in hemp combine to slow digestion, which prevents spikes in blood sugar and therefore sustains the body’s energy. A diet rich in hemp also promotes digestive regularity. When sprinkled on cereal or fruit at breakfast, hemp protein and fibre also helps aid in satiety, which will prevent you from snacking and will keep you fuller for longer. The Omega-3 fatty acids in hemp reduces the risk of cardiovascular disease, lower blood pressure, and may even ward off Alzheimer’s disease. Hemp seeds are one of the few Omega-3 sources found in plants.The Omega-6 fatty acids in hemp stimulate skin and hair growth, maintain bone health, regulate metabolism, and help the brain function. Hemp seeds contain essential amino acids, which improves muscle control, mental function, and normal body maintenance of cells, muscle, tissues, and organs. So basically, to sum up hemp is “the business” and I highly recommend including it in your diet. 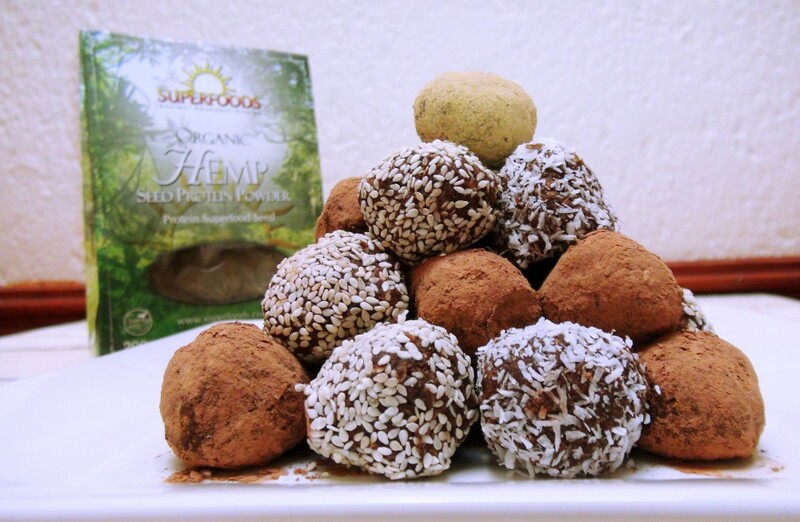 I recently made the most delicious treat using Soaring Free Superfoods Organic Hemp Seed Protein Powder, which I got from the Faithful to Nature Online Store. I wasn’t so sure how hemp would combine with dates for this sweet and healthy snack, but its natural nutty flavour actually paired perfectly with the ingredients I used. These were enjoyed by everyone in my house, and even though I made a large batch, they are already all gone, so I definitely recommend making these in bulk. You can freeze and then defrost these as needed, otherwise they keep for up to 2 weeks in a well-sealed container. So this means, your on-the-go snacks sorted! Soak dates in ½ cup hot water and allow to soak overnight – this softens the dates so that they become easy to blend. After soaking, add to blender and blend thoroughly to form date paste. Place date paste to a large mixing bowl. Add Superfood Organic Hemp Seed Protein Powder, oat flour,vanilla extract,cacao powder, and cinnamon and stir vigorously to form a sticky dough. Place almonds and pecans in a food processor and blend thoroughly until they form a rough crumble. Add ground nuts to stick flour mixture and stir thoroughly until well combined. You can also use your hands to blend the ingredients. Pull off small pieces of the dough and roll into medium sized balls. Once you have used up all the sticky dough, divide protein balls evenly into three batches. Coat the first batch with cacao flour, coat the second batch with desiccated coconut and coat the remaining batch sesame seeds. You can do this by simply rolling the protein ball in the given coating. I like to fill three small bowls with each coating and then roll the protein balls in the coating. The small bowls allow for maximum coating to adhere to the protein balls. 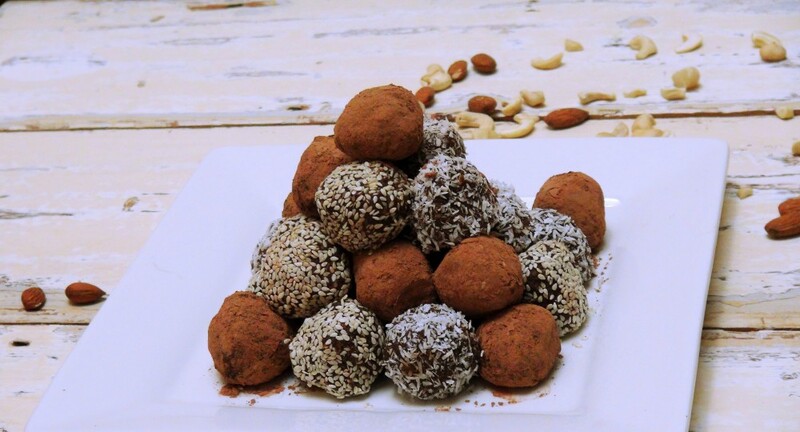 Once all protein balls have been coated, place on a serving tray and refrigerate. Serve chilled alongside your favourite cup of tea. 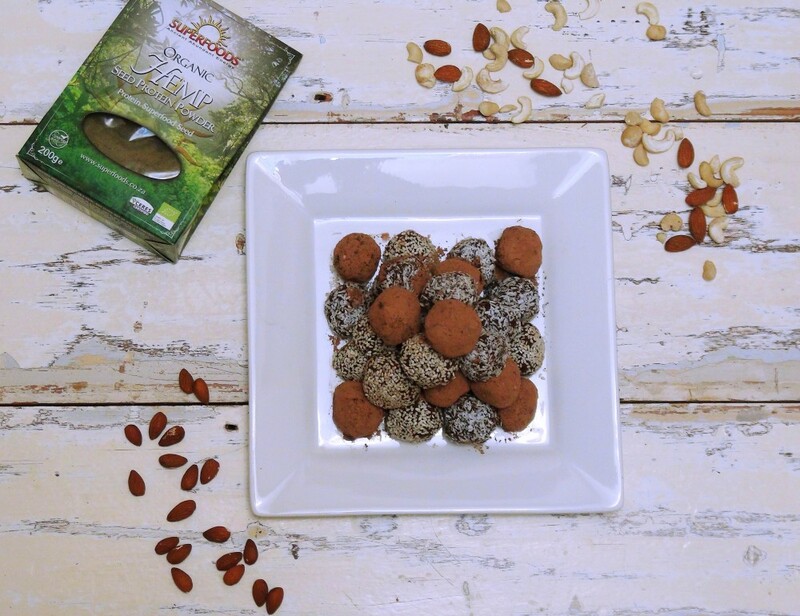 Or enjoy as a mid-afternoon snack for an extra burst of energy and protein. Also fantastic as a pre-workout snack.